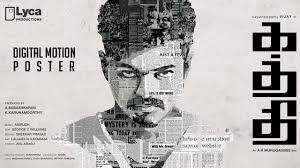 Kaththi – Movie Review with spoilers! What you think of a movie is influenced majorly by the mood in which you went to the movie. I went in a happy mood to watch the movie. And it turned about to entertaining for me. On the surface, the theme will look banal. Dual role; one a rogue and the other an activist; places get swapped and rogue develops conscience. But the way the things are handled and the technical aspects make the movie watchable. The issue that the movie touches and sends message about is very key and relevant. Of course, there are positives and negatives about the movie and that’s what I will be talking about now. The movie had a grand opening. A prisoner escapes; police chases; frame freezes; a flashback is shown depicting the crook as smart. Add to this the theme music and different camera angles with a twist in the sequence. Had the movie been taken in the same momentum, it would have been a fantastic movie. But the movie slows down significantly in trying to explain lots of things unnecessary for the plot. The crook Kathiresan (kaththi) fills himself in the place of Jeevanandam (second role) who is an activist against corporations that deplete water resources in Tamil Nadu villages. Then the movie carries on forward to show how Kathiresan got touched by the story of the village and decides to fight for them in the absence of Jeeva. The actress Samantha, who plays the love interest of Kathiresan, has no scope to perform in the movie at all. She just shares some screen space. That’s all. Similarly, another character that I think was underdeveloped was that of the villain played by Neil Nitin Mukesh. The introduction for this role was good. But it soon fizzles out. He fails to make a mark as a villain as Vidyut did in Thuppakki. The songs were not great although ‘selfie pulla’ song is a major hit. But the background score is impressive. The Bad Eye theme used for the villain’s entry and The Sword of Destiny theme used in various scenes are good. Some part of The Sword of Destiny reminds me of The Immortals song. The action scenes were choreographed really well. Particularly, the one with the bunch of coins was well thought of. The movie takes a dig at city people for not caring about village issues and the media for ignoring the key issues for more sensational topic. The movie is long running for 2 hours and 47 mins. The movie was indeed entertaining but could have been better. Kaththi – (Knife) was sharp but long. It could have been named as ‘Vaal’ (Sword).